I have a question for you guys, my friends dog chewed up the corner of my couch and I am just wondering if you guys might know how to repair it while being frugal. Thanks for any help you might offer. I have used this trick before, when a Lazy Boy chair seat was badly worn. I later reupholstered the whole chair, but this got me through for many years! Since most sofas are up against a wall, use the fabric on the back as repair material. You can always get a plain color matching fabric to put on the back. No one will be the wiser. Upholstering an area is not that hard. Ok, this doesn't look as bad as it sounds.....I have 4 kids, 3 pets and worn furniture. 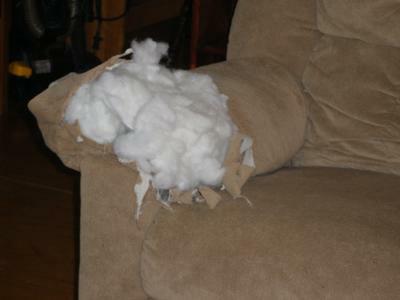 The cats had totally torn up a corner of the sofa. I took the arm cover that came with the sofa, removed the end and was left with a rectangle of fabric. I hot glued the fabric to the area....watch to match the pattern. It looks fine and stays on well. My kitten has put some very small but noticable holes in my boyfriend's leather couch. Is there an inexpensive way to fix it? I have a chocolate leather sectional with some stitching coming apart. I'm looking for someone who can come sew it back properly. My cat has used my couch as a scratching post when I'm asleep. I just discovered a lot of holes in the arm. Any idea how to fix it? Editor's Note: First, find something else for the cat to scratch on. I'd put a scratching post right near the arm of the couch, both arms if they are both being scratched. If the holes are small, you may be able to sew shut the holes. If they are large, try to find a piece of fabric to match and patch it. Another thing you could do is make some arm covers out of a coordinating fabric and cover the arms with that. I have a love seat I'm restoring and the wood deco on the back top is half missing, can this be replaced or ?. I just bought a leather couch from a friend and realized that the seam behind one of the cushion is ripped. Is it easy to sew the seam? I just don't want it to rip more. My doberman ate the arm of my berkline wallaway couch how can I fix it myself?? I am looking for a company that would sell springs for my build. Can someone help me out please? email 396hr AT sbcglobal.net subject it "springs". Well you just need to sew it up the best way you can and spread some arm rests (the ones with fur) on top of both the arms. That should do the trick.